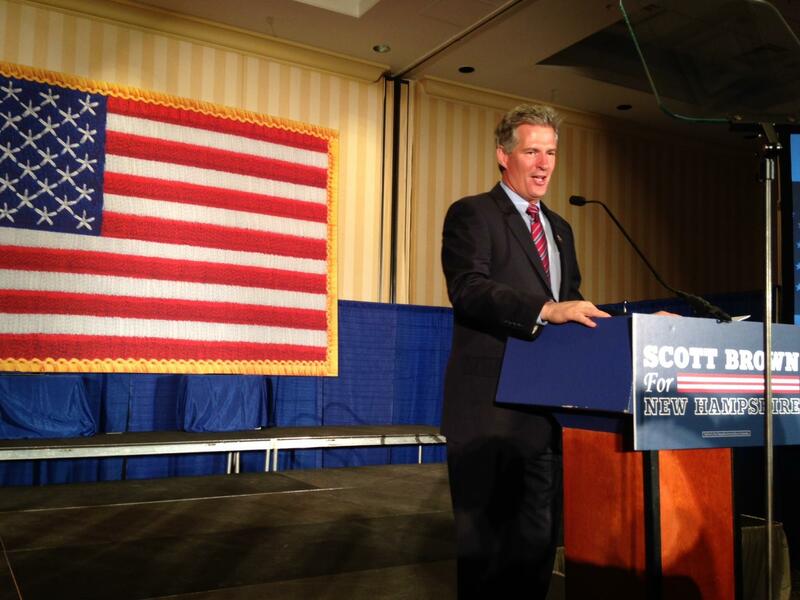 Scott Brown gives victory speech, says "Town halls still matter in NH"
For the third time, former Congressman Frank Guinta will face Carol Shea-Porter for New Hampshire's District 1 seat in the U.S. House of Representatives. Guinta won the Republican nomination in Tuesday's primary, taking 49 percent of the vote. Dan Innis, former dean of the Whittemore School of Business and Economics at the University of New Hampshire and co-owner of Portsmouth’s Ale House Inn, received 41 percent, while libertarian Brendan Kelly won 8 percent. At the hotel he owns with his husband, Innis told supporters it was a tough race, and that while he was looking forward to getting back to teaching at UNH, he would return to the political arena. "I'm not going to go away," he said. Guinta beat Shea-Porter in 2010, but lost to her in 2012. He barely mentioned Shea-Porter in a speech to supporters in Manchester, appealing instead for a return to non-partisan problem solving. "That is why we have to unify, not just as Republicans, but as Americans, and finally send a message to Washington: 'Enough is enough," he said. "Start thinking about people again, start thinking about the needs of communities across the state of New Hampshire, start thinking about those families who wonder where their next paycheck is going to come from, and get serious about solutions, and about ideas." The Associated Press has just called the Congressional District 2 Republican primary for state Rep. Marilinda Garcia. She will face incumbent Congresswoman Ann McLane Kuster. With 77 percent of precincts reporting, Garcia had 50 percent of the vote, compared to 26 percent for former state senator Gary Lambert and 18 percent for former state representative Jim Lawrence. Garcia was elected to the state legislature in 2008, at the age of 23. She was tapped by the Republican National Committee as a “rising star,” and received endorsements from several national political figures, including Texas Gov. Rick Perry and Sen. Ted Crus of Texas, who visited the Granite State to campaign for her. The race between Garcia and Lambert, the two front runners, was nasty at times. Garcia benefited from nearly $500,000 in support from the Club for Growth, which bankrolled an ad calling Lambert “laughably liberal” for his support of a regional cap-and-trade program. Lambert was criticized by some Republicans for his attacks on Garcia. In August, he began running ads accusing Garcia of supporting “amnesty” for undocumented immigrants and for saying she would not repeal certain provisions of the Affordable Care Act. Following a televised debate earlier this month, Garcia refused to shake Lambert’s hand. But, after the results were in Tuesday, Lambert praised Garcia as "a great young leader for our party." "Marilinda will stand up for freedom, economic opportunity and the American dream," he said. In the general election against Kuster, Garcia will likely have to defend her stated opposition to policies strongly favored by Democrats, including a minimum wage increase, the Paycheck Fairness Act and the Violence Against Women Act. At a campaign gathering at the Centennial Hotel in Concord, Garcia took aim at Kuster's support of the Affordable Care Act. "She votes with the president over 95 percent of the time," she said, "and, again, if you’re like me, you agree this president and this administration’s policies are not moving in the right direction." Walt Havenstein, a former defense industry CEO with no political experience, easily defeated tech entrepreneur and Republican activist Andrew Hemingway to win the GOP nomination for New Hampshire governor. Havenstein, who had won more than 56 percent of the vote with two-thirds of state precincts reporting, will face the Democratic incumbent, Gov. Maggie Hassan, in November. Speaking to supporters in Manchester, Havenstein said New Hampshire "cannot afford two more years of Maggie Hassan." "And when we go head-to-head I'll show the distinct differences between between our approach to problem-solving," he said, "our distinct differences when it comes to growing this economy which is so important for job creation." Havenstein was considered the establishment choice over Hemingway, who at 32 was vying to become the youngest governor in the state's history. Former Republican presidential candidate Mitt Romney has endorsed Havenstein, and New Jersey Gov. Chris Christie, widely thought to be considering a run for president, made two trips to New Hampshire to show his support. A former Marine, Havenstein led BAE Systems of Nashua and Science Applications International Corp. before retiring in 2012. He has made his business background central to his campaign, proposing a three-phase economic plan – called “8.15.17/25,000” – with the goal of creating 25,000 new jobs. Havenstein opposes casino gambling and, unlike most Republicans, seems unwilling to re-fight legislative battles over Affordable Care Act and Medicaid expansion in the Granite State. Money may be a problem for Havenstein in the general election. Of the $2 million he raised before the primary, $1.5 million came from his own pocket. As chairman of the Republican Governor's Association, Christie's support will help. But whether other Republican outside groups will step up and help will depend on how competitive the race is. Meanwhile, Hassan is vice chair of the Democratic Governor's Association, which spent more than $8 million to help her defeat Ovide LAmontagne in 2012. Addressing a crowd of supporters, Hassan signaled that she would campaign on the bipartisan cooperation she credits for her legislative achievements. Former Massachusetts Sen. Scott Brown moved one step closer to returning to Washington with a win Tuesday in the Republican U.S. Senate primary. With just over a quarter of the states 301 precincts reporting, Brown had just over 49 percent of the vote, according to the Associated Press. His two main opponents, former state senator Jim Rubens and former U.S. Sen. Bob Smith, split most of the remaining ballots. In a speech to supporters in Concord Rubens, who received about $1.4 million in support - and some national publicity to boot - from the anti-corruption MayDay PAC, said the media had failed to cover the substance of his campaign. And he suggested that if Smith had dropped out of the campaign, he might have been able to eke out a victory. "Because we have divided ourselves into two factions, we have allowed the establishment to win, prevail, suppress debate, prevent the country from moving forward on key and vital issues," Rubens said. Brown will take on Sen. Jeanne Shaheen in November, a match-up that seemed like a foregone conclusion from the moment Brown entered the race in April. Aside from a single television debate, Brown virtually ignored his primary competitors and, with the help of several deep-pocketed outside groups, went right after Shaheen. Taking his cue from Republican candidates around the country, Brown immediately began framing the race as a referendum on the Affordable Care Act. A day after launching his campaign, he began an "Obamacare Isn’t Working" tour, calling Shaheen "the deciding vote" in the Senate for the health care reform law. Brown won a special election in 2010 to replace the late Massachusetts Sen. Edward Kennedy, but he was beaten handily in 2012 by Democrat Elizabeth Warren. He moved to New Hampshire, where he had a vacation home, in 2013. Early polls showed Shaheen with leads of 8-10 points over Brown, but that margin appears to have narrowed in recent weeks. In late August, a poll conducted for the political group American Crossroads had Shaheen with a 3 point lead. A more recent CBS News/NY Times poll showed Shaheen with a six point lead. The contours of the coming battle in the general election began to take shape while primary voters were still trekking to the polls. Shaheen's campaign released two new television ads Tuesday. One touts her record, including her role in preventing the closure of the Portsmouth Naval Shipyard and in securing funding for the I-93 expansion and the Memorial Bridge project. The other amplifies familiar attacks on Brown, including votes he took when he was in the Senate that allowed the five largest oil companies to continue claiming certain deductions to reduce their tax bills. If Brown beats Shaheen, he would become only the third U.S. senator to represent more than one state. In comments at the Puritan Conference Center in Manchester, Shaheen didn't outright call Brown a carpetbagger. But the message was clear. "The fact is, Scott Brown may have changed his address, but he hasn't changed his stripes," she said. "So now Big Oil and the Koch brothers and Wall Street are spending millions to get Scott Brown back to the Senate. But we are not going to let that happen. New Hampshire is not for sale and New Hampshire is not Scott Brown's consolation prize." In the closely watched Democratic primary for District 15 state Senate, Concord attorney Dan Feltes is coasting to an easy win over Concord School Board member Kass Ardinger. With 10 of 13 precincts reporting, Feltes is leading with 68 percent of the vote, according to the Associated Press. 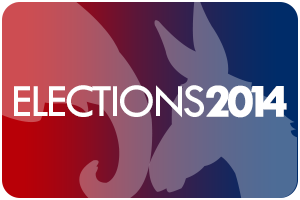 “It is with great excitement that the Democratic Party congratulates Dan Feltes on his nomination as the Democratic candidate in Senate District 15," said New Hampshire Democratic Party chairman Ray Buckley. "As the Democratic nominee in a district that has been a stronghold for forward-thinking progressives, we look forward to supporting Dan in what will surely be an impressive legislative career fighting for the families of the 15th district." District 15, comprised of Concord, Hopkinton, Warner and Henniker, is predominantly Democratic. The seat was held for the past 20 years by outgoing Democratic Sen. Sylvia Larsen, who endorsed Ardinger, and is expected to easily go to the winner of the Democratic primary. Lydia Dube Harman of Warner is unopposed in the Republican primary. Feltes received endorsements from several labor unions, including the Professional Fire Fighters of New Hampshire and the State Employees Association. The candidates appeared to share similar views on the issues, but the race grew tense when Feltes accused Ardinger, whose husband is a former Republican state representatives and a registered lobbyist, of opposing full-day kindergarten in 2009. With polls starting to close across the state, returns are starting to roll in. In the race for Republican Gubernatorial candidate, Walt Havenstein leads Andrew Hemingway 57% to 37%, with 8% of precincts reporting. In the GOP primary for U.S. Senate, Scott Brown leads with 49.4% of the vote over Jim Rubens (25%) and Bob Smith (21.9%), with 8% of precincts reporting. In the GOP primaries for U.S. House, Frank Guinta leads in District 1, with 50% of the vote, over Dan Innis (42.4%), with 12% of precincts reporting. Marilinda Garcia leads in District 2, with 51.7%, over Gary Lambert (23.7%) and Jim Lawrence (16.2%), with 3% of precincts reporting. Note: Use the "Select Office" dropdown to view results from a specific race. Candidates for the U.S. Senate, governor, Congress and the state legislature are on the New Hampshire primary ballot Tuesday. 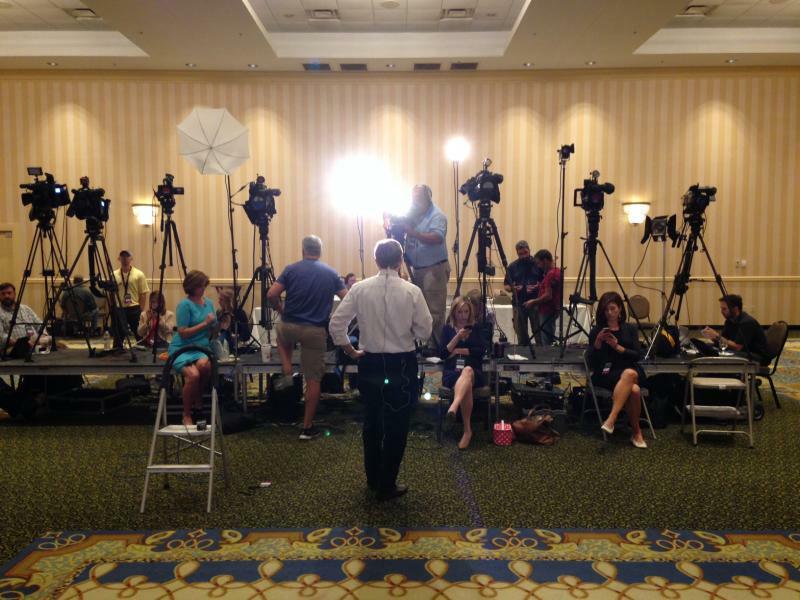 Click through our Primary 2014 gallery above to see the day unfold in photos taken by NHPR reporters, the campaigns, and New Hampshire voters.